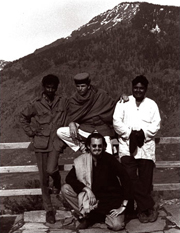 From left to right: James Killough, Production Coordinator; Mohan Kumar, Assistant; Leatherdale; Paul Talbat, Driver. 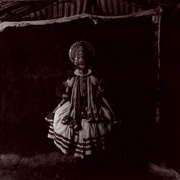 A contemporary perspective of timeless, traditional India as seen through portraiture. These exhibitions illustrate Leatherdale's exploration and profound interest in the diversity of the Indian People. His camera lens cuts through India's caste system, shooting Maharaja to Harijan/untouchable. Leatherdale lived, part time in Banaras, India for 6 years. Dwelling in one of the oldest cities in the world, he was fascinated by how unaffected India's people were by the passage of time. This work is not meant to be an overall study of contemporary India. It is a personal vision... Marcus' India. Leatherdale is well known for his black and white conceptual theatrical portraits in which he recreates or invents myths. Bharat Tasvir continues his newer approach to portraiture where he has chosen to photograph his subjects as they are, allowing their individual wardrobes and spirituality to create their own drama. The efforts of James Killough were instrumental in facilitating the production of many of these images. Marcus Leatherdale moved in 1998 to Hazaribagh in South Bihar to work with Bulu Imam and the Birhor Adivasis. In 2000 he relocated permanently to Chottanagpur in Jharkhand, where he has set up a central work compound (and a Medical Care Team) from which to photograph all the tribes of India.